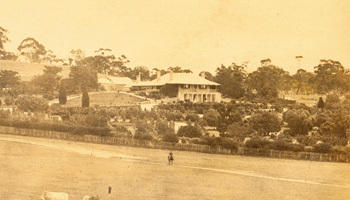 The King George VI & Queen Elizabeth Stakes at Ascot; the Prix du Jockey Club at Chantilly; the Lockinge Stakes at Newbury; the Dubai World Cup at Meydan; the MRC Oakleigh Plate at Caulfield… they are some of the most iconic events on the international thoroughbred racing calendar. They also comprise five of the 10 Group 1 races already won in 2015 by the ultra-gifted progeny of Dubawi! The single most pre-eminent aspect of world thoroughbred racing this calendar year has been the amazing feats of the Dubawi breed. Since February 2015, only one month of international competition has gone by without a coveted Group 1 event having been won by a son or daughter of the incredible Dubawi. That’s right, the very sire of Goldin Farms’ foundation stallion AKEED MOFEED (GB). When Postponed won a hard-fought battle to claim the coveted King George VI & Queen Elizabeth Stakes at Ascot last weekend, the number of individual Group 1 winners in 2015 sired by Dubawi climbed to nine. These include the exceptional Australian racemare Srikandi, winner of both the Stradbroke Handicap and Qld Tatt’s RC Tattersall’s Tiara in June — accounting for two of Dubawi’s 10 Group 1 wins worldwide. Such is Dubawi’s dominance of world thoroughbred racing in 2015, this amazing stallion leads every Group/Grade 1 sire category. Not only in terms of number of Group 1 winners (nine) and Group 1 wins (10), but in respect of win prizemoney (£6,878,449) and total prizemoney (£7,694,526). 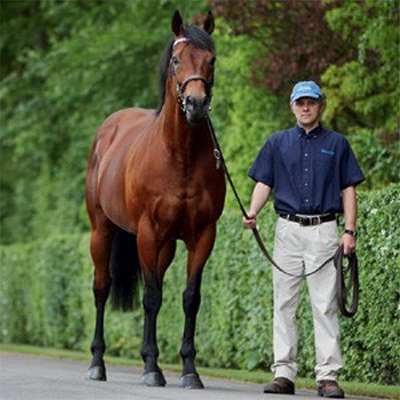 In every instance, Dubawi’s figures by far and away exceed those of any contemporary. All things considered, Dubawi is the new world force when it comes to international thoroughbred racing. Could there be a better time to breed to a sire-son of AKEED MOFEED‘s obvious quality? Broodmare owners receive an opportunity to bid on a 2015 breeding season nomination to AKEED MOFEED this Friday afternoon when one is to be auctioned at the annual South Australian Racehorse Owners’ Association (SAROA) Horses Birthday Lunch. Held at Morphettville Racecourse, this annual event is staged by the SAROA on the Friday closest to the official birthday of all Australian thoroughbred horses. Part of the proceeds are kindly donated to the National Jockeys’ Trust (NJT). SAROA’s objectives are to promote racehorse ownership in South Australia and generally to represent the interests of racehorse owners to ensure a viable industry in SA. SAROA is a not-for-profit organisation, and dependent on members’ subscriptions and fund-raising events such as this to carry out its objectives. It is managed by a hard-working committee of volunteers. Goldin Farms is delighted to support this wonderful cause by donating an AKEED MOFEED nomination scheduled to be auctioned during the course of the afternoon by the Magic Millions Sales company’s very well-known State representative, Adrian Hancock. Significantly, the SAROA Horses Birthday Lunch is an income tax exempt charity endorsed by the Australian Taxation Office. The cost of attending is $95.00 per person and includes a three-course lunch. South Australia’s leading racecaller Terry McAuliffe will host an occasion that will also feature Adam Sangster as guest speaker as well as an interview with South Australia’s leading apprentice jockey Caitlin Jones. Late bookings can be made by contacting NJT general manager Tony Crisafi on 0430 211 098. This is an exciting time for AKEED MOFEED with his first foals now due. 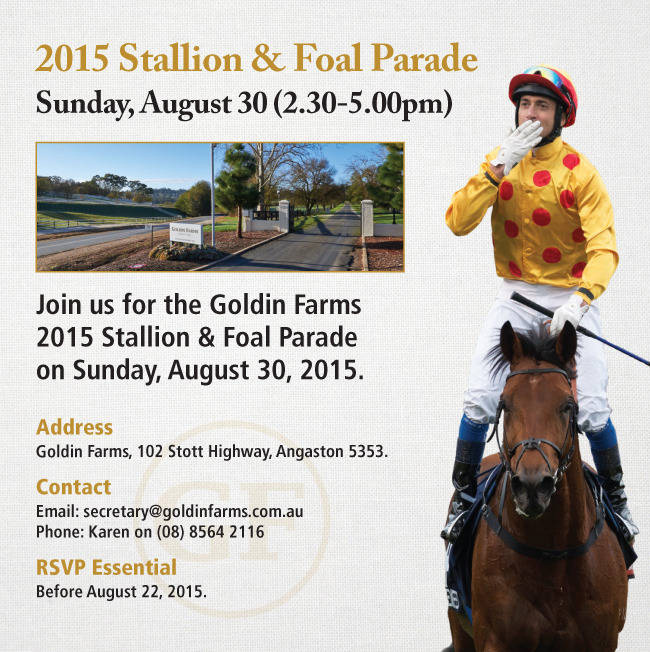 We invite you to join us for the Goldin Farms 2015 Stallion & Foals Parade on Sunday, August 30, 2015, between 2.30-5.00pm. 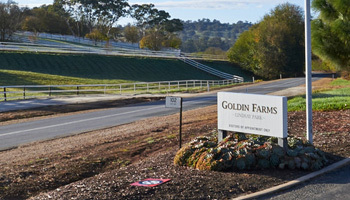 In addition to parading AKEED MOFEED and a select number of the stallion’s first foals on the ground, we also hope to provide an insight into Goldin Farms and our long-term objectives for a celebrated horse property formerly known as Lindsay Park Stud. Refreshments will be provided during the course of the afternoon. RSVP is essential and can be made by contacting KAREN on (08) 8564 2116 or by emailing secretary@goldinfarms.com.au.